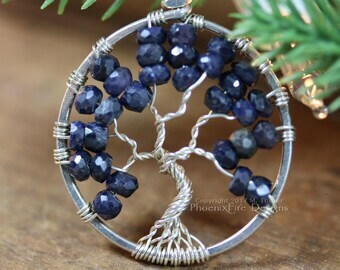 Announcement Tree of Life pendants, handmade wire wrapped jewelry, family birthstone, rainbow moonstone, Boho Jewelry, Celestial necklaces, lunar pendants, Mother's Jewelry, Bird Nest Necklaces, Steampunk jewellery, Bride, Bridal and wedding pieces and more all handcrafted and made in the USA. Custom Orders always accepted! 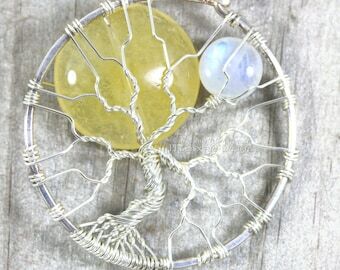 The ORIGINAL Tree of Life on Etsy since 2006! Despite what "others" may claim, just look at the date my shop opened: Opened on Oct 4, 2006. Facts don't lie. Accept no substitutions or poorly made, cheap copycat items. PhoenixFire Designs is often replicated but NEVER duplicated!! PhoenixFire Designs is my business and my passion. I put a lot of care and love into each of my pieces, and I pride myself on flawless feedback, wonderful customer support and truly caring about my buyers. I am always happy to discuss custom orders, recreating something previously sold, or modifications of existing pieces. Since it's all made by hand from scratch, the possibilities are nearly endless! Please don't hesitate to contact me with your ideas! As always, I thank you for your continued support! If you're in the Tampa Bay Area, come see me at various shows and markets throughout Clearwater, Tampa, Seminole Heights, Hyde Park, St. Pete, Dunedin and more! Follow us on Facebook to see our show schedule. 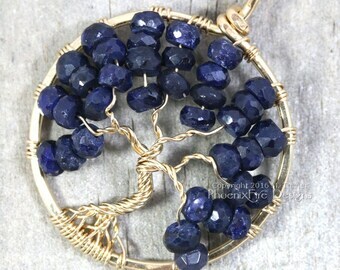 Tree of Life pendants, handmade wire wrapped jewelry, family birthstone, rainbow moonstone, Boho Jewelry, Celestial necklaces, lunar pendants, Mother's Jewelry, Bird Nest Necklaces, Steampunk jewellery, Bride, Bridal and wedding pieces and more all handcrafted and made in the USA. Custom Orders always accepted! Just a lovely piece and just the right size! Will definitely be back at some point! PhoenixFire Designs REMAINS OPEN AND WE ENCOURAGE YOU TO CONTINUE SHOPPING. Please be advised we are located in Tampa, FL so we are closely monitoring hurricane Irma. Delays in processing and shipping might be possible so we ask for patience at this time. Natural rainbow moonstone. 14k yellow gold. Wearing a pice of your own galaxy? Priceless. Shop #PhoenixFireDesigns for yours! 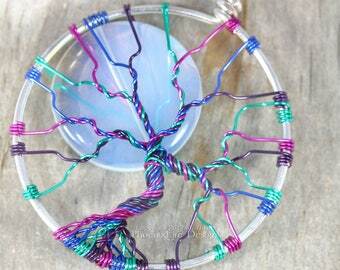 Glow in the dark full moon tree of life pendants. Which is your favorite? Brown wire, silver wire, or black wire? Click link for #PhoenixFireDesigns shop to get yours. 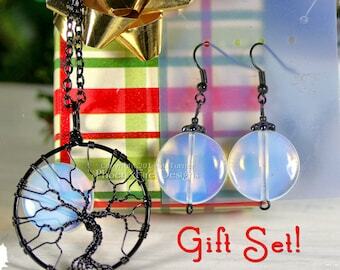 Natural rainbow moonstone full moon trees in silver or black wire. 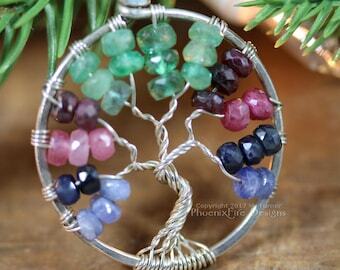 We use only the finest, precious and semi-precious gemstones such as the rainbow of colors in this Chakra Tree. With a wide range of birthstones, colors and gemstones the sky's the limit! We also gladly customize. 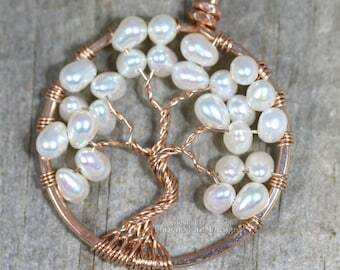 Each piece is handcrafted from scratch such as this Bridal Freshwater Pearl tree in 14k gf wire. Here are the common sizes of trees in the shop together for reference. 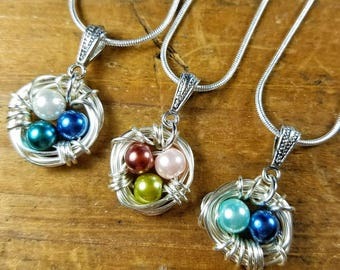 Unique, Beautiful, Hand Crafted Jewelry Made with Love For You. Greetings! I'm Miss M. Turner and I am the woman behind PhoenixFire Designs. I live in Florida with my guy and two kitties. I've been on Etsy since 2006, though it's only since 2011 that I decided to run this shop as my full time business. A medical crisis and major surgery were the turning point for me. May 2011, in massive pain, I went into the ER and discovered I had almost three pounds of tumors in my uterus. At age 34, I was facing hysterectomy. But first, I had four months of difficult treatments to make me safe enough for surgery and desperate need to raise the necessary funds. On October 5, 2011, I had my surgery and though my day job laid me off while in recovery, surgery was a success and after a full year of slow recovery, I am healthier now then I have been in years. I decided to take this hardship and turn it into opportunity. So I hope you'll consider helping me in that goal. PhoenixFire Designs is my business and my passion. 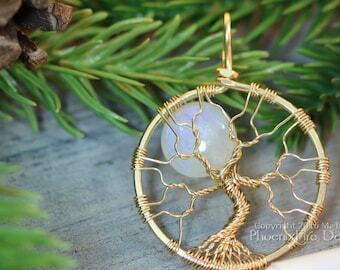 I create hand crafted jewelry with my signature item being the Tree of Life pendant. I put a lot of care and love into each of my pieces, and I pride myself on flawless feedback, wonderful customer support and truly caring about my buyers. Every single thing in my shop is made by hand, by me. Everything you buy is an original. I don't just design items and have a factory churn them out, or hide behind some third-world sweatshop. I twist and shape the wire with my bare hands, embellish it with hand-selected gemstones and transform it into wearable art personally. It is TRULY handcrafted by me for you. My shop has also been a way of healing something inside of me that was dinged and tarnished through the fear and stress of major surgery. It's been a "bright light" and a positive way for me to help give back something beautiful to the world. If something you like has sold in the past, convo me; it might be possible to make it again. I also will gladly work with you to create something custom, personalized and one-of-a-kind. Just drop me a note! I appreciate all the support I've received during this difficult time in my life and thank you for helping me move forward both financially and also creatively. I appreciate my repeat customers! When you order, you will receive an email with a coupon code for free shipping on your next purchase. M. Turner wears many hats; creating all the pieces in the shop, photographing them, listing each piece and running orders to the post office! Overcoming major health crisis in 2011, she uses the shop as an opportunity in the face of challenge. Known as The FLÖÖF, Ginger, prides herself on her attention to detail in assisting with proper product placement when taking photos. Each and every step of the process is handled by maker M. Turner personally, from conversing with customers, photographing jewelry, creating each piece from scratch, through to wrapping and shipping each every package. Each piece is an original handcrafted in her Tampa, Florida studio and is 100% American Made. Nothing is mass produced, nor factory created. Because this is truly a one-woman business, PhoenixFire Designs does not offer wholesale discounts. The prices are NOT padded or exaggerated, keeping them affordable pieces of wearable art. A 10% off discount is offered as a thank you for large orders over $200. Use code "OVER200" at checkout. Also "Like" PhoenixFire Designs on Facebook for updates and sales! Except under extreme circumstances, all orders are final. For health and safety reasons I will not resell an item after it's been shipped to a custom. Please, no returns. Buyer's remorse/changing your mind is not an "extreme circumstance." Payment in FULL is due for all orders (ready made and custom order) and no supplies are ordered nor work will begin on items until full payment is made. Payments via PayPal E-Check do not ship until funds clear - typically about one week. 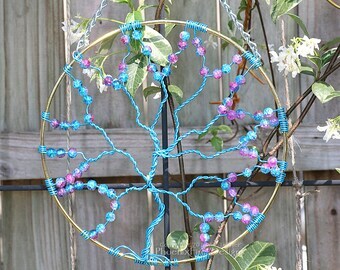 PhoenixFire Designs has been a verified PayPal Business account holder since March 2001 so you can buy with confidence. With years of satisfied customers literally the whole world over, we look forward to making something special for you too. Unless otherwise noted, all items are handmade from scratch upon receipt of your order. This means there is a turnaround time between when you place your order and when it ships. Domestic packages ship First Class and take an average of 3-6 BUSINESS days to arrive but can be more or less depending on time of year. All items ship with Tracking. If a package is returned/undeliverable due to a buyer providing an incorrect address, buyer is responsible for paying additional shipping charges required to reship package. First Class Air International and typically takes 10-21 business days to arrive depending on customs. Tracking should to work for the following countries: Australia, Belgium, Brazil, Canada, Croatia, Denmark, Estonia, Finland, France, Germany, Gibraltar, Great Britain and Northern Ireland, Hungary, Israel, Italy, Latvia, Lithuania, Luxembourg, Malaysia, Malta, Netherlands, New Zealand, Portugal, Singapore, Spain, Switzerland but not all packages will give complete route info. Federal law requires that I accurately identify and value items shipping internationally on a customs form. Items will be listed appropriately and for the cost paid (less S&H.) Any taxes, fees, or surcharges incurred are the sole responsibility of the buyer. The shipping fee you pay to me for your order represents the actual cost for the United States Postal Service to deliver your package from the US to your country. It does NOT include any customs charges, taxes or fees. Those are assigned by YOUR country and outside of my control or responsibility. I SHIP FROM A BUSINESS ACCOUNT AND CANNOT MARK ORDERS AS GIFTS ON CUSTOMS FORMS. MARKING MERCHANDISE AS "GIFT" IS MAIL FRAUD AND ILLEGAL UNDER UNITED STATES FEDERAL LAW. Packages that are returned due to unpaid customs fees and/or taxes must be claimed by the buyer within 5 days of return or will be considered abandoned and no refund will be given. Buyer is responsible for paying the additional shipping charges required to reship returned packages. If tracking shows delivered, but buyer cannot locate package there is nothing more I can do from this end. Buyer will need to contact their local post office for additional information on specifics of delivery. Often the local branch and/or mail carrier can help locate the misplaced package. The USPS requires lost or damage claims on domestic packages to be made within 60 days of shipping: "For damaged or missing contents, we recommend filing a claim immediately, but you must file no later than 60 days from the date of mailing. https://www.usps.com/ship/file-domestic-claims.htm " After 60 days, there is nothing that I can do for lost and/or damaged packages. Quote: "If you buy something from a business that is based outside the EU, the Consumer Rights Directive does not apply. If something goes wrong with a purchase you make from a website outside the EU, the website's own returns and refunds policy will apply. So make sure that you have read and understood the site’s returns policy before you buy something." I am a US-based business. Therefore, please refer to my policies including my return policy and understand they are applicable to ALL buyers without exception. Thank you. I'm happy to send an item directly to a gift recipient. Simply note in your order that you wish it to go to a different gift address. I am also happy to include a note to the recipient as well - just tell me what you'd like in the "notes to seller" section at checkout. Jewelry is wrapped securely in bubble wrap and presented in a drawstring organza bag (suitable for gift-giving!) and mailed in bubble envelopes. All items are made and packed in a completely smoke free home. However, I do have two cats and there is a chance of a stray hair or two getting in a package despite my best attempts otherwise. The items themselves being metal and gemstone shouldn't have any problems with holding allergens but those with extreme sensitivity might want to be careful of the packing materials. I gladly accept custom orders! If something I have made sold and you're like another, or if there's something you like but want personalized, or if you have an idea for something different please feel free to convo me with your thoughts! I'm happy to work with you to make the perfect, personalized item for your needs. Payment is due IN FULL when order is placed. This is because I often must purchase supplies specific for your custom piece and sadly, I have had people confirm a custom order, then I order supplies and create it for them, only to decide they don't have the money to pay. As a result of a handful of unscrupulous buyers, I must now request payment in full up front. I will be glad to send a photo of the completed piece prior to shipping to verify it is as ordered. In the unlikely event that you're not satisfied, we can discuss changes at that time. Custom orders are FINAL once the item is shipped. Thank you for your understanding. By its very nature, handmade jewelry is going to be inherently more delicate than something mass-manufactured. It's important to always apply the "last on; first off" rule meaning put your jewelry on last when getting ready and take it off first. It's also important to NEVER submerge handmade jewelry in any kind of liquid, nor use any abrasive cloths, brushes or cleaners as it can damage the piece. Do not wear in the shower, tub, pool or other time when the piece may get submerged in water.